Hi! This is Debbie at Confessions of a Plate Addict! I am so excited that Kim has asked me to share my favorite room with you! 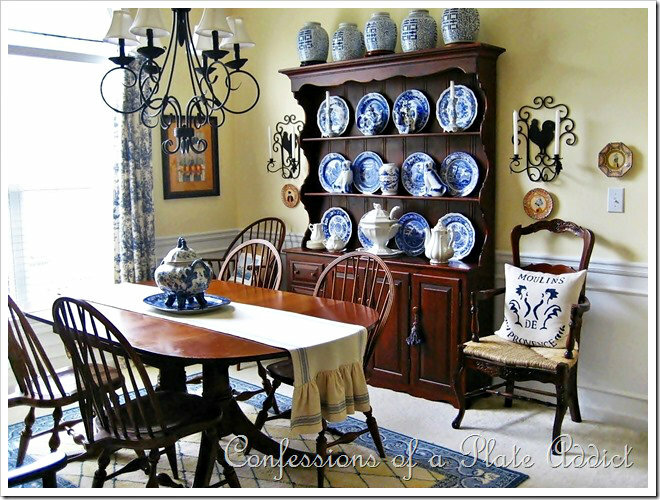 And…from the title of my blog, I am sure you can almost guess which room that is…my French Country dining room! However…it’s not just about the plates as you will soon see. But first, let me tell you a little bit about myself and how my style came to be. As a French teacher, I have had the wonderful opportunity to live and travel in France over the years and to visit and be a guest in beautiful homes, like this farmhouse in Provence where I spent some time a few years ago. How could I help but fall in love with French Country style! But eventually the birth of my first grandchild drew me back home to Georgia. And I knew what I wanted to do…create a little bit of France in my own home! So I began to look for pieces that reflected what I had seen in France. …vintage Quimper faïence found at the Sunday antique market in L’Isle-sur-la-Sorgue, France. It depicts a couple in the traditional dress of Brittany. I love the way Quimper comes in pairs…and I find that I have to have them both! I can’t separate the little couple, after all! On top of the hutch is my collection of double happiness jars…named for the Chinese symbol pictured on the face of the jars. Except for my original jar purchased 40 years ago, they have all come from thrift stores and flea markets. Although the centerpiece on the table may change with the seasons, this is my favorite…a pumpkin-shaped tureen that I found in slightly funky Grayton Beach, Florida! Love it! It was sitting on a shelf looking over my shoulder and calling my name while I was eating breakfast in a little café! I love blue and white…can you tell? Always present somewhere in the dining room is the vintage Red Cliff ironstone tureen that was my mom’s. I love the grape motif! I have since been lucky enough to find a few more pieces in the Red Cliff grape pattern in thrift stores, such as the sugar and creamer that you see on the table. ...is my Victorian silverplate castor set! 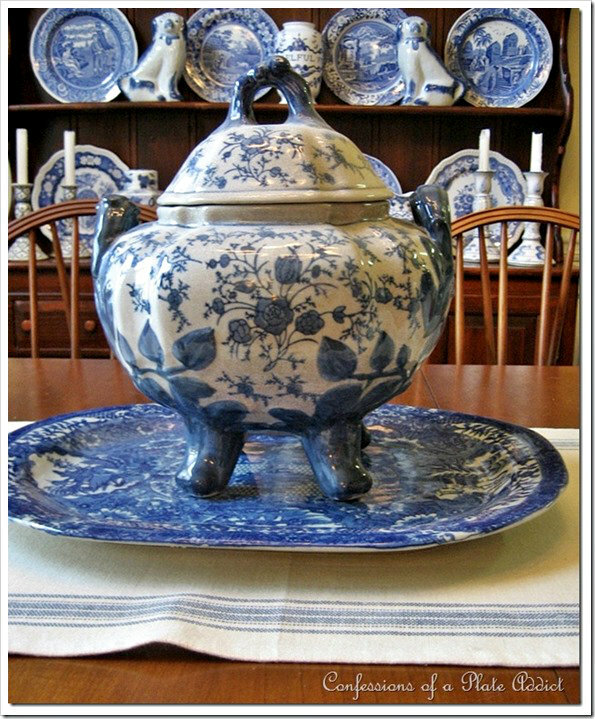 It is a favorite flea market find and another piece that is always on display! I seem to have a thing about antique silverplate! And this one was a steal…a real “start the car” moment! One of the things I like best about this room is the fact that I can dress it up so easily and change the look with just a tablescape! 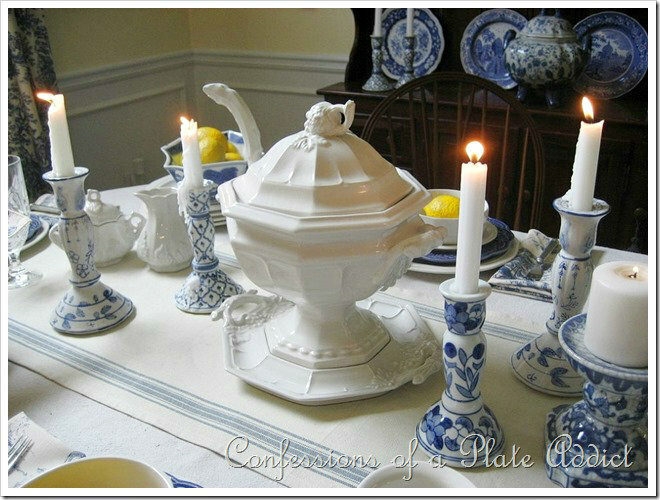 Here, we are having a French Country supper with layers of linens. The tablecloth is actually a drop cloth topped with my faux grain sack table runner. In fact, many of the linens that I use on my table are not French at all…because that can be expensive…but my much less expensive copy-cat versions of vintage French linens. And I love decorating my dining room for the holidays! Here it is all dressed in a Thanksgiving tablescape using a ruffled burlap table runner to anchor it. …wearing its Christmas garb and stealing the show on my hutch! But I can also dress it down for every day with favorite pieces from my blue and white collection. In fact, this little tool box has proven itself to be quite versatile! It’s a fun addition to my dining room! I think this room is my favorite, not only because it is filled with things that I love, but because, of all the rooms in my home, this is the room that feels more French to me. It gives me a little chance to escape and dream about past adventures in France and hope for more to come! Thanks so much to Kim and to you, her readers, for allowing me to show you my favorite room! I hope you will come to visit me at Confessions of a Plate Addict where you can get a little peek at the rest of my home! I’ll be looking for you there! Thank you, Debbie. If any of you have never visited Debbie's before be sure to get comfy and pop on over. She is really good with crafts, too so you might want to check out her tutorials. Miss any of the past guest posts? Check them out here. Love it! I enjoyed the more in depth look at your dining room Debbie! Pretty French Inspired dining room. You make me want to run out and start collecting blue and white transferware.... Thanks for sharing. Thanks for introducing me to this great blog. Love her style. Have a wonderful weekend, Kim!! Hi Debbie & Kim, Both your dining rooms are some of my favorites. Thanks for sharing your lovely room with us, Debbie. Love your blogs. Kim thank you for having Deb as a guest, I love her as a friend and love her warm and inviting home as well, DEB! this is my favorite room in your home as you well know. The patina of the wood in this room is like satin. All the blue and white and Quimper you have is amazing. You have a keen eye when it comes to finding the perfect piece and where to place it in your home. So fun to see the dining room change out for the seasons. Beautiful style and decor. I really love her pillows too! What a treat!! Thanks for sharing this beautiful tour! 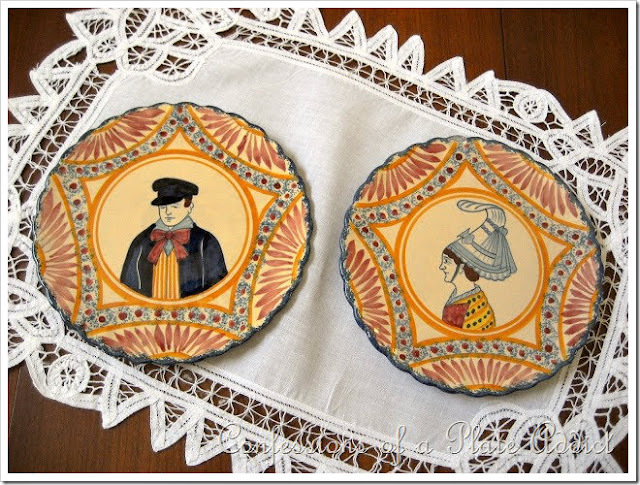 From the English Staffordshire to the French Quimper pieces, I love Debbie's collection. I am a fan of Quimper, and have purchased pieces from the Quimper stores in Alexandria (VA) and Stonington (CT). And also in France. Sadly the Alexandria store near us closed a while ago. Marvelous room, collection and home!!!! I love that you collected those jars over the years too Debbie! Thanks for the intro Kim! Love it! The blues...the yellows...French Country...oooh la la!! Love her dining room and dish collection! Debbie has great style! Gorgeous style mixed with all that blue & white, so very pretty! I have loved Debbies blog for a long time. Her staff of kitty cats keep her in line and she is the envelope style pillow slipcover diy queen. It was great to hear your inspiration for your French style. It is why I have shells and beachy things all over my Illinois home...I like to be surrounded by things that remind me of places I love. Your dining room is stunning...blue and white is so fresh, crisp and your collection is wonderful! 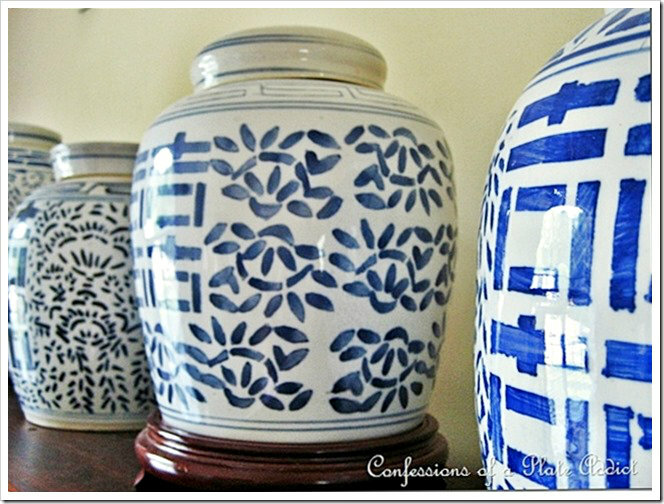 Love your collection of blue and white. Your dining room is beautiful. Kim thanks for showing us Deb's beautiful dining room. Your dining room is beautiful, Deb....in all seasons. Debbie - Your dining room is wonderful and all of your collections are stunning. I enjoyed finding out where your love of all things French originated from. Do you ever look for any pieces to add to your collection at Replacements or do you just enjoy the thrill of the hunt? I love Debbie's frenchy style! Thank you so much for introducing Debbie! I will now receive her blog via e-Mail. I loved the ironstone so much that I popped over to e-Bay and picked up a few really nice pieces including one identical to her tureen! May I inquire where she found the faux grain sack table runner with the blue? I just love it! 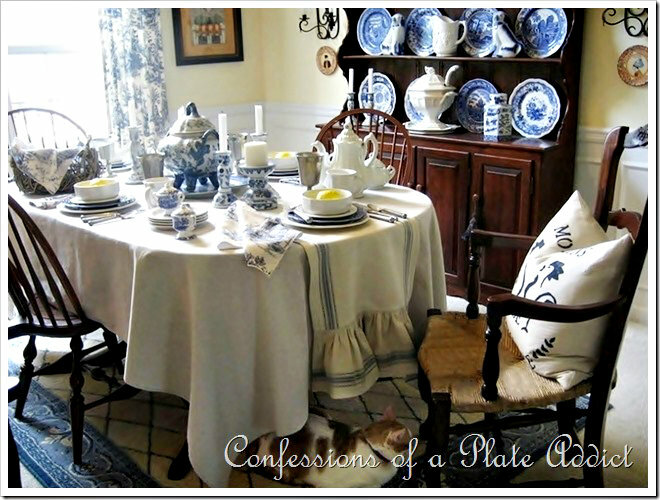 I have always admired Debbie's name for her blog because that describes me to a T.Yes I am plate attict too!What a beautiful dining room!Love Debbie's style and her collections too!I too have that castor set and mine was also a steal!So enjoyed reading this! Love your warm French style Debbie! Love your blue and white china. Lovely post. Debbie's home is a sure charmer! I always love seeing what she is up to. A beautiful post by a wonderful collector -- really inspirational. Holy blue & white goodness, I love this woman. Great room and impressive collection! Kim, how many people do you know.